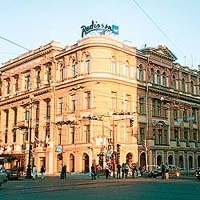 The international hotel " Radisson SAS Royal" in Saint-Petersburg brings success. The general manager of the international hotel " Radisson SAS Royal" in Saint-Petersburg Оliver Staas is appointed the regional director on the Baltics, Saint-Petersburg, Sochi and Baku. As has informed today, July, 23, in conversation with journalists Mr. Staas, appointment was held in the beginning of July. In his opinion, the network in Russia develops very dynamically and here there is a lot of opportunities for hotel business. Now the network of hotels " Radisson SAS Hotels and Resorts" consists of 111 working and 31 builded hotels in 38 countries of the world. The network is the unique representative " Radisson SAS hotels and Resorts Worldwide " in Europe, on Near East and in Northern Africa. The head company includes 758 hotels in 63 countries of the world and five steam-ships of the first class. Business news archive for 23 July' 2002.